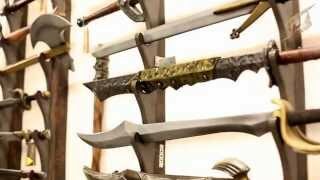 Epic Armoury LARP archery is a range that offers you many options for choosing the bow or crossbow of your choice. In addition to LARP bows and LARP crossbows, the range also include LARP arrows, quivers, hand protection, accessories, and spare parts for our bows and arrows. The archery equipment focuses on functionality, precision, and most importantly safety. The bows and crossbows have a limited draw weight making them ideal and safe for LARP. The arrows are engineered for a safe use both when new and also after use through many battles. With the skills to master bows and crossbows, the archer has the power to inflict damage from a distance. With our selection of bows, crossbows, and arrows, you will have a wide range of safe solutions suited for any archer costume. To complete the costume and to supply the archer with arrows, we have a wide selection of handcrafted quivers in various styles and designs. Remember, when playing as an archer, never aim for the head and loose the arrows with safety in mind.